The launch of the Tansat satellite was the main subject of my interview with RTL, to come out this week. 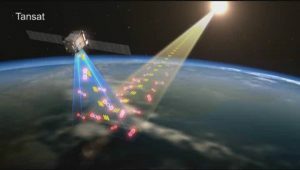 TanSat (Chinese Carbon Dioxide Observation Satellite Mission) was launched in December 2016 by China to monitor carbon dioxide levels, making it the third country to track the potent contributor to global warming from space, along with USA and Japan. The technology will trace the sources of greenhouse gases and help evaluate whether countries are fulfilling their commitments to reduce pollutants under environmental pacts. China is a signatory to the Paris climate change agreement, the first universal action plan for curbing global warming. The US and China are together responsible for some 40% of the world’s emissions, so their participation in the agreement is crucial for its success. So, if incoming President Trump fails to respect commitments, China will take the lead. China is the world’s largest emitter of greenhouse gases, due to its heavy reliance on coal to provide electricity to its population of 1.37 billion. It has been fast moving away from coal—driven in large part by the major recent air pollution.